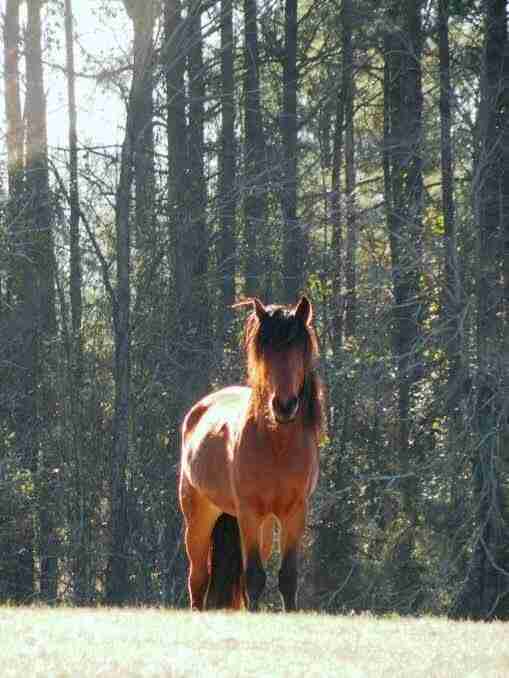 Journey was just a baby mustang when he was first trapped. Separated from his family, he faced the awful onslaught of low-flying helicopters, as they ran him and his friends at breakneck speeds over dangerous terrain into traps. Confused horses ran into barbed wire fences or collapsed from the trauma of the high-speed chase. Journey was caught and imprisoned in a holding pen with others like him. Free-roaming horses like Journey have survived on their own for decades on nearly 798,000 acres set aside for them by the U.S. government - the land is known as the Twin Peaks Herd Management Area of northern California and western Nevada. However, cattle ranchers pressure the Bureau of Land Management (BLM) to curb the horse population, resulting in brutal roundups of inhabitants. The Wild Free-Roaming Horses and Burros Act of 1971 allows the Bureau to remove "excess" horses from public lands to allow livestock to graze. The BLM has long defended its actions, saying that the roundup helps "to maintain the ecological health of our nation's public rangelands" and that it is "committed to increasing its use of current fertility control vaccine ... "
Horse lovers, however, find the roundups to be cruel and some of the sterilization experiments conducted by the BLM on mares inhumane - and they advocate for an alternative. After his first roundup, Journey was released and entrapped a few more times before he was permanently taken away from Twin Peaks. He endured the terror of recurring roundups, an unimaginable horror for a young colt. Life in the pens and designated pastures is no picnic. 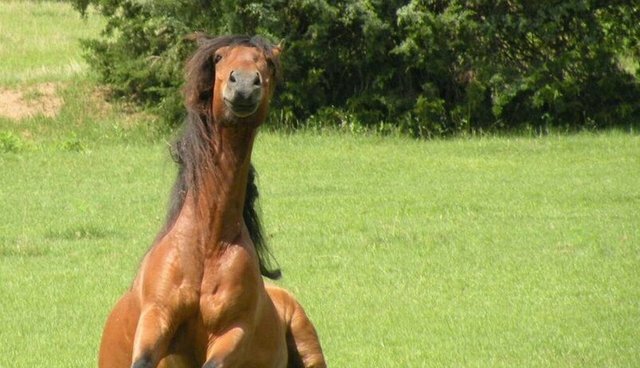 These horses, who have known nothing but independence, suffer in captivity with no room to run, and they often struggle to find shade. They've not only been separated from their families and range, but they're also fearful of humans, whom they have never encountered before. 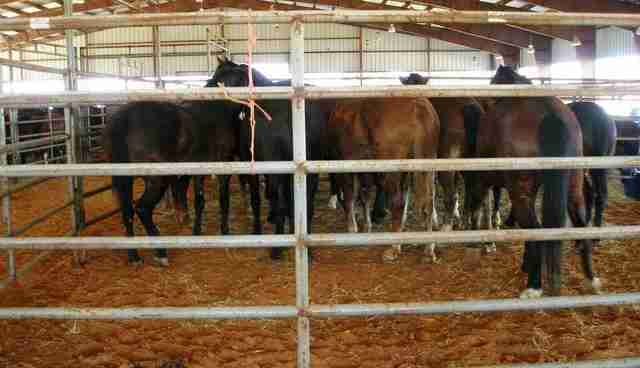 With the public's taxpayer money, BLM keeps up to 50,000 horses in long-term holding facilities for years, instead of releasing them back on the range. Many don't survive the capture and captivity. A report by the American Wild Horse Preservation Campaign stated that wild horse deaths are attributed to diet and metabolic failure, a result of physiological changes induced by the trauma of the roundup, poor conditions at the holding pens and traumatic injury "including broken necks, spinal and pelvis injuries, fatal hoof and leg damage sustained in the helicopter stampede." 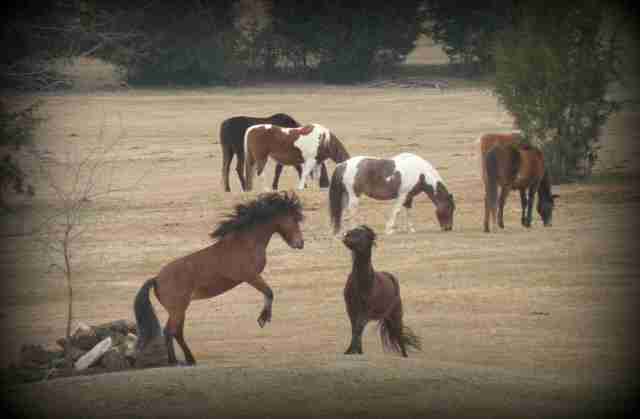 Some of the wild horses are auctioned; Journey was among those who was gelded, branded and prepared for adoption. From the cooler temperatures of his homeland, he was shuttled to the heat of Florida. 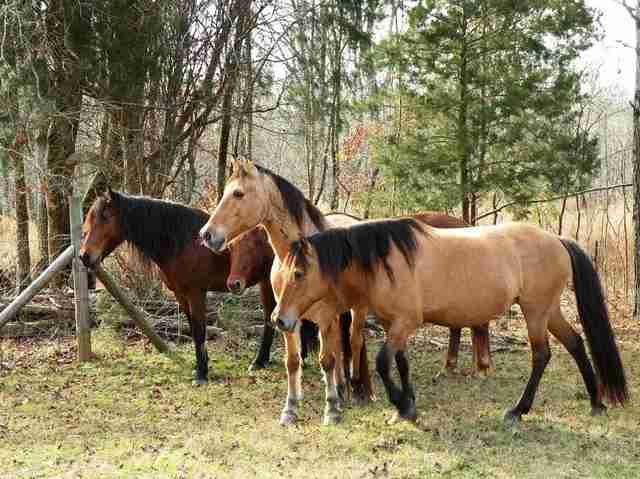 Many wild mustang buyers aren't aware of the consequences of managing unhandled horses. With a lack of knowledge comes the inability to properly care for an animal. Journey changed hands until one day, when he was emaciated and depressed, a kind woman bought and nursed him back to health. 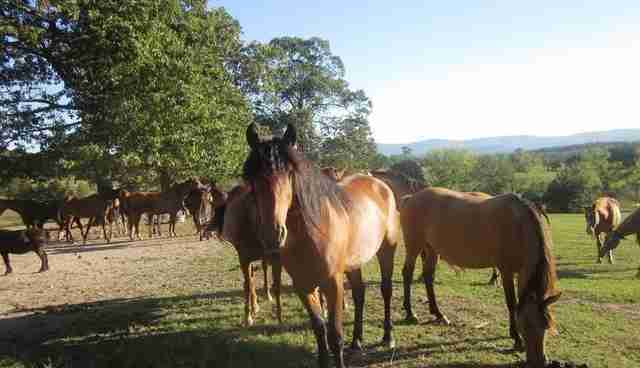 She then alerted Melanie Sue Bowles, the founder and director of Proud Spirit Horse Sanctuary, in Arkansas, in 2011. Bowles didn't hesitate one second before agreeing to take Journey, who was about 4 years old at the time. "After learning about the brutality he suffered as he was ripped from his family in several different roundups, I was determined to give him back his freedom," Bowles told The Dodo. "The day we opened the gate and let him run is one I'll never forget. I can still see his flying mane and hear his pounding hooves as he raced to join the Proud Spirit herd - his new family." Proud Spirit is one of the longest-running sanctuaries for abused, neglected and orphaned horses in the country. 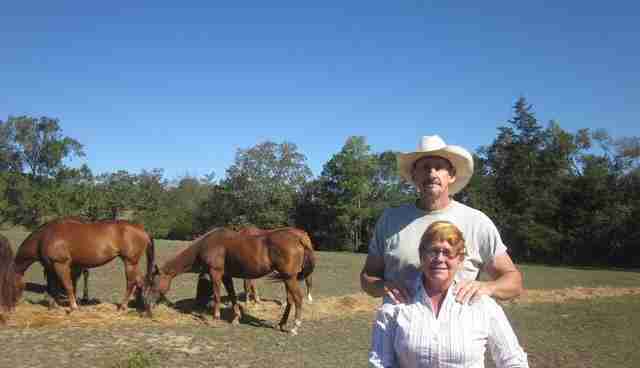 With help from her husband, Jim, Bowles has come to the rescue of more than 300 horses in the sanctuary's 25-year run. Once arriving at Proud Spirit, animals are treated with the respect and attention they deserve. 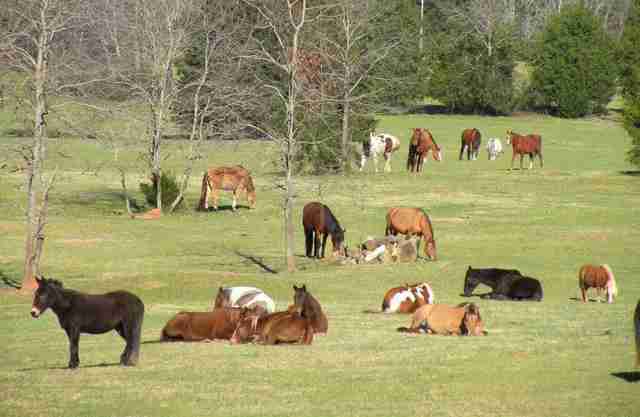 They are at liberty to roam the grounds and live the rest of their lives in peace. There are no holding pens, adoptions or pony rides. 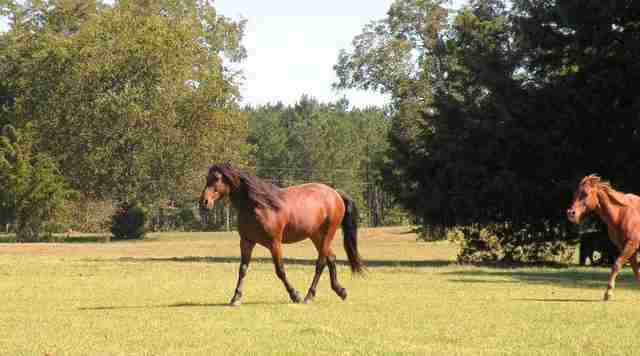 Beautiful, healthy and carefree horses live happily as part of a herd at Proud Spirit. Arrangements were made for Journey to travel from Florida to Arkansas. More than 320 acres of rolling hills near the Ouachita Mountains awaited him. When word spread of the need for transportation funds, Sara Gruen, author of "Water for Elephants," offered to cover the cost for Journey to make it to his forever home. "What I love about Proud Spirit is what I love about Melanie and Jim," Gruen, who has been a long-time supporter, told The Dodo. "Proud Spirit is the physical embodiment of their courageous and generous natures. Their desire to provide these horses with the best possible and most natural of lives has resulted in the horse equivalent of The Four Seasons." 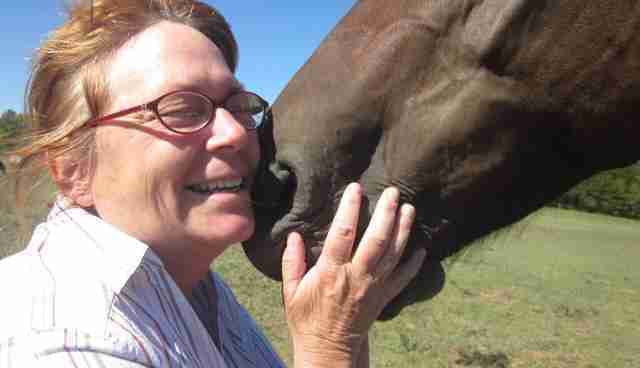 "I truly believe the horses in their care know exactly how lucky they are," Gruen added. Despite being a wild horse and having had multiple prior owners, the love and kindness Journey receives at Proud Spirit has transformed him into a gentle and calm mustang. "We brush his mane, trim his feet and halter him now, just like any of our horses," said Bowles. "We have to make sure he allows us to touch and handle him, to take care of him for health reasons." 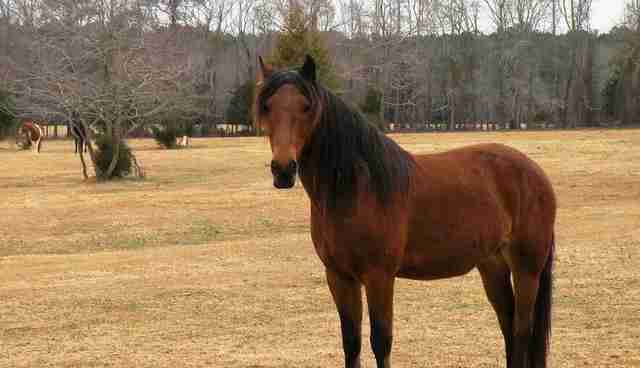 Journey, who turns 10 this year, currently lives in Proud Spirit's new home in Lincolnton, Georgia. He is the leader of a small herd, roaming unimpeded on 175 acres. Proud Spirit is home to 48 rescued horses, nine dogs, a couple of cats and two pigs. "We are one of the few, true sanctuaries that return a horse to a life of freedom, and we respect the bonds they form with the herd," Bowles said. He may have lost his family before, but Journey will never know that heartbreak again, thanks to the good-natured people who ensured his freedom. Learn more at horsesofproudspirit.com. 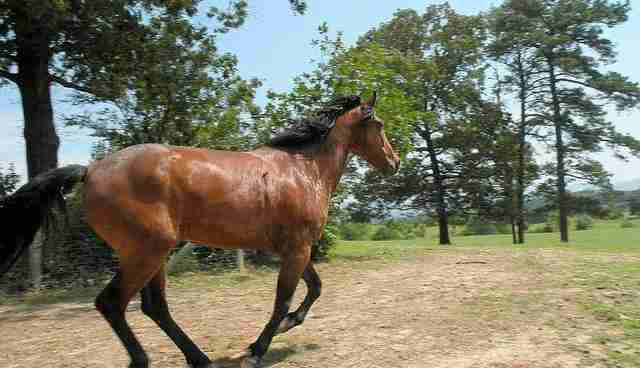 To follow Journey and other horses, visit Proud Spirit's Facebook page.